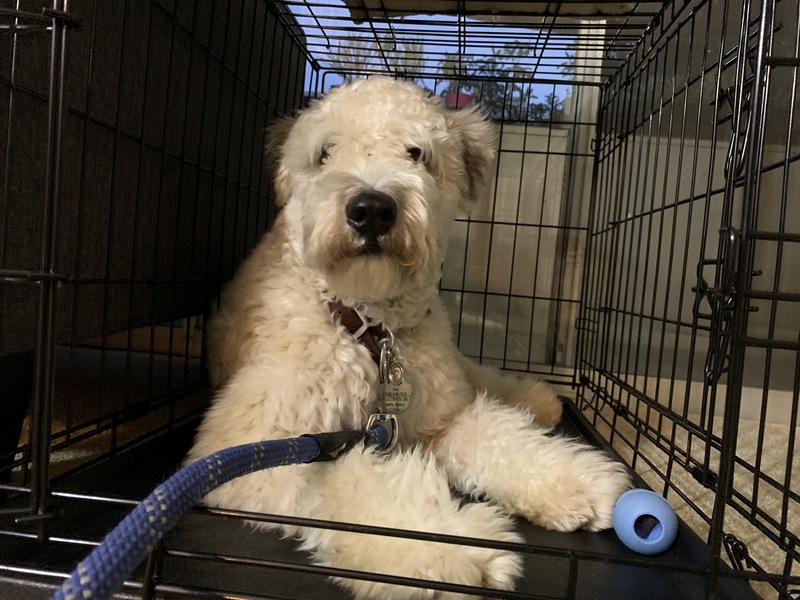 For this Santa Monica dog training session, we shared tips to help a dog stop acting aggressive to new people so that eleven month-old Whoodle (Wheaton Poodle mix) Akio stops reacting to people and dogs on walks. Aiko and his guardian met me outside his home. As a dog behaviorist I have learned that when you are dealing with a reactive or aggressive dog, meeting in an open space can be very beneficial. I used some dog behaviorist tricks and was able to generate the starts of a positive association. By the end of our interaction outside, he was walking next to me calmly and without any reactivity. I sat down with the human and dog to get more for mission on the aggressive behavior problems. Once I learned that the dog could be petted or interacted with away from his guardians, I knew that this was a case of protective or possessive behavior. I could also tell that Aiko was anxious and pretty stressed out, likely from having cortisol in his bloodstream. Cortisol is the stress hormone and prolonged exposure can cause any animal to become anxious or nervous. A dog version of PTSD if you will. Generally this manifests with twitchy or jittery movements, pacing, heavy breathing and overreacting to small things. I shared a number of dog psychology tips that should help redefine the leader follower dynamic. Little things like asking the dog to earn it’s affection, restricting access, asking the dog to wait or eating before feeding can all go a long ways towards helping remove the burden of responsibility Aiko feels which will allow the dog to stop feeling stressed out and cause the addition of the stress hormone to stop. The guardians will also need to watch out for behavior associated with the dog attempting to claim things or show dominance / ownership like jumping up on humans when they return home, stop his marking on walks and object when he tries to scent mark the furniture by rubbing his shoulder or side on furniture or the humans. To help boost his confidence, I suggested the guardians start teaching him a new trick or command each week for 2-3 months. This will give the humans more options to distract him, help boost his self esteem and deepen the dog’s respect for the humans as authority figures. Many dogs who act aggressively do so as a defense mechanism in and attempt to get the other dog or person to move further away. Building up their confidence and helping them identify as a follower are crucial elements with rehabilitating a dog that’s insecurely aggressive. To help the dog practice not acting aggressive, I handed my camera to the guardian and sat down on the floor so I could demonstrate some positive dog training techniques that should help. Helping the dog practice approaching and moving away from people on it’s own, with the people not encouraging, trying to pet or interact with the dog will go a long ways towards helping him develop more self-esteem and confidence. Once this is the case, he will stop acting aggressive when approached by strangers. This will be the case of a lot of repetition of positive reinforcement and stage scenarios that sat the dog up for success. Before we wrapped up the session I went over a counter conditioning exercise the guardian can use to help Aiko get over his fear of various sounds. However they would be wise to wait until the structure we added today helps reduce the cortisol level in his blood before trying that technique. I’m hoping the guardians can arrange to have visitors come over to the house a few times a week to practice the techniques that I described in the above video. They can start this while they are still teaching him how to catch, something that they need to master very quickly. This way, the dog can build up some momentum and positive experiences of new people and is home. To help the guardians remember all the positive dog training tips and suggestions made during this in-home dog training session, we shot a roadmap to success video that you can check out below.